NFL season is upon us, and it's time to start digging all the beautiful numbers and stats that will lead us to victory. In this article we will breakdown the DraftKings NFL Week 1 Pricing by focusing on the QB, WR and TE positions. When pricing drops for the players in the first week of games, it can be kind of an overwhelming thing for us to handle. There are a plethora of conclusions that we jump to without thinking about it, and just as many questions that we decide not to ask based on biases we have developed over the last year and off-season. Something that is really important in these first few weeks is really getting a handle on who is priced correctly, and who needs to be looked into deeper so we aren't overpaying for someone based on face value and group think. What I'm going to do today is show the prices for the main guys in each game for week one. I'll give both the Draftkings and Fanduel prices, and try to show a distinction between the two and look for some opportunity within the pricing algorithms. If someone is priced very highly on one site, and is much cheaper on another, there may be something that one is taking into account that the other hasn't, and that is where we need to take advantage. While looking for these discrepancies, I added both the Fantasy Points Per Game (FPPG) and the football outsiders ranking of the opponent in the applicable category (Historical DvP statistics can be found in our premium research tools) in an attempt to give a little more insight into mispriced players. Finally, I'll be highlighting a couple plays that I believe are mispriced due to a couple different factors. I'll try to point out a couple different price points as well, since I think it's important to be open minded to all routes of roster construction, especially in the first week. This article is Part 1 of a 2 part series by James McCool. Editor's Note: Join us for Premium NFL DFS this season! Without further ramblings, let's take a look! 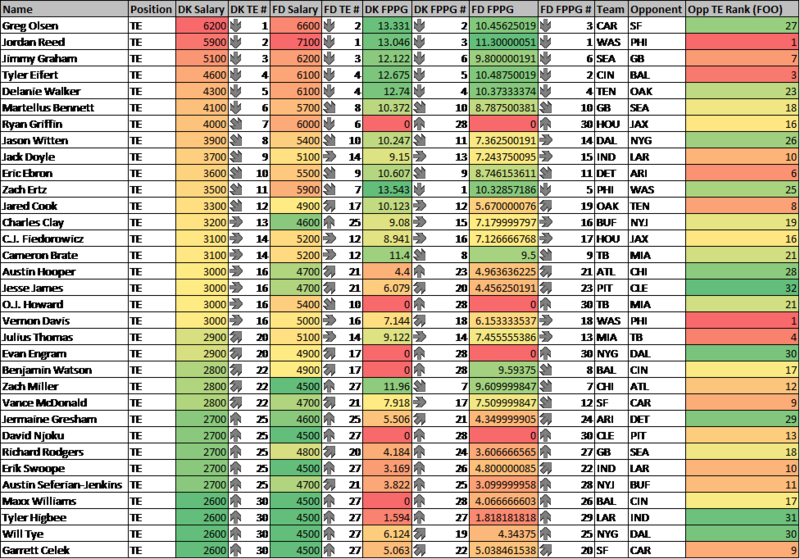 Draftkings typically does a very good job of spreading out salaries for the starting QBs in week one. From what I understand of it, the algorithm uses a combination of previous performance, current match-up, and recent ownership to develop a price for each player (in super basic terms), so it would make sense that the QBs in great match-ups are priced towards the top due to it being the most prevalent attribute to build from. Ben Roethlisberger, Cam Newton, and Aaron Rodgers are the three highest priced QBs for week 1, and none of them are really egregiously priced. I think the pain threshold for a top tier QB is $7000 before it starts to be cutting into a realistic ceiling, and with $7300 being the highest available I don't have a huge issue paying up for QB in the right spot this week. Towards the bottom of the pricing is a mix of bad QBs like Brock Osweiler and Jared Goff, with the clusters of unknown situations for the Texans, Bears, Jets, etc. With a first look at pricing, there's a good chance that I end up trying to pay down and let the high priced QBs go to the new players and unexperienced people just looking to play and watch the game. Typically, I like paying up at QB since people love to pay down, but the strategy is a bit different in the first week as people just build from name value and their favorite players. Somebody like Carson Wentz ($5300) could be a nice starting point, but more research is obviously necessary to make those kind of decisions. Rodgers is the 3rd most expensive QB on DK, and the 2nd most expensive on FD, but was the #1 QB in DFS overall in 2016. His matchup at home against the Seattle Seahawks is difficult, but not unbeatable. If this were in Seattle, it would be a bit different, but the Packers have one of the largest home field advantages in the league, garnering an automatic 4 point edge over the opposition, and having a total over 30 in the majority of their home games since 2014. Per Football Outsiders, the Seattle Seahawks are only a slightly above average defense against the pass, ranking 13th out of 32 teams in 2016. Richard Sherman can't cover the entire field, and the defensive line can't generate enough pressure to reach the QB effectively. Rodgers is priced lower than he should be here due to match-up, but he has historically been one of the best (if not THE best) QB in fantasy when playing at home. Andrew Luck is priced as the 9th most expensive QB on DK, but the 4th most expensive on FD. This is a pretty large difference as is for one of the elite QBs in the league, and even over on fanduel he appears to be slightly undervalued after finishing as the #3 QB overall in 2016. Luck has to travel to the West coast and take on the Los Angeles Rams, which is a significant downgrade as he loses not only his home field advantage, but also must play out of the home field dome in Indianapolis. The Rams are an underwhelming team against the pass, having finished 2016 ranking 20th Aaron Donald is one of the best pass rushers in the game but the secondary leaves plenty to be desired. The departure of EJ Gaines in the Sammy Watkins trade will be a boon, but we can't know whether a third string CB is any better. Andrew Luck's price is being depressed due to insecurity with the injury situation, but if healthy he should be a couple hundred more expensive. Blake Bortles is priced as the 26th most expensive QB on DK, and the 17th most expensive on FD. That is a difference of almost 10 spots. In 2016, he was the #7 QB in fantasy on DK and the #12 on fanduel, and when you consider the price DraftKings has him as a pretty significant bargain for week 1. Generally being on the road is a big issue for QBs (and teams overall), but Bortles gets a bit of an upgrade traveling to playing the Texans in their dome, and his home field advantage is basically meaningless with how bad the Jaguars have been. The Texans do have a good defense, and Bortles will be scrambling for sure, but the downside here is baked into his price. Blake Bortles passed more than 26 other starting QBs last year, and I know that Fournette exists now but I don't think it cuts into Blake Bortle's attempts all that much. They will still be playing from behind a lot, and may actually be in closer games giving them more of a reason to get downfield. Bortles is very bad, but his performances in real life don't matter. The volume is there and the upside is great at only $4800. WRs seem to be pretty well priced out for the first week, if we are speaking simply in terms of historic performance. The pricing tiers are very clear up and down the board, with our typical studs in the top from about $7500 and up, followed by the “Matchup Studs” (as I prefer to call them) priced about $6000 and up to $7200. Below the two top tiers is a pretty large grouping of WRs that don't inspire a lot of confidence but still possess plenty of upside if you can land the right game (guys like Davante Adams and Alshon Jeffery). I've always thought that it was kind of interesting how WRs are priced, because it doesn't really change all that much from match-up to match-up. Only in a few cases do teams really give a bump in price to opposing WRs (The Browns and the Jets, for example) so even when a WR has a really bad spot they maintain a pretty static price tag. With a first look, I have no issues at all fading the expensive WRs. I have plenty of worries for pretty much every WR priced above $6900, and would much rather have the consistency and floor of the high priced RBs than try to spend the money on OBJ on the road or Dez Bryant against the #1 pass defense in the league. I'm open to changing my mind there, but my first thought is that the mid-tier of WRs are better point per dollar buys. 3rd most expensive WR on both sites, but finished as the #6 WR on DK and the #5 WR on FD. Not only is he slightly overpriced compared to historic performances, but his match-up and new position within the offense make him even less appealing. OBJ plays on the Road at Dallas, a team that plays very slowly thus limiting potential volume, and has an above average defense against WRs. With the Addition of Brandon Marshall and a great TE taken in the draft, will Beckham still have majority market share? Will his red zone targets disappear? It's hard to expect him to replicate a #6 overall performance, much less be a top play on the day. Odell Beckham Jr. is an explosive and very talented player in a muddle situation against a great defense in a slow game. Pass. 8th most expensive WR on DK, 9th on FD, and his 2016 numbers don't even come close to backing up that price tag as he finished 14th and 13th overall, respectively, on each site. Plays on the road at Tennessee, which is a plus match-up, but the Titans run a zone scheme that makes big plays difficult and that is about all that Amari Cooper is good for as his red zone targets have never been there. The Raiders were an incredibly efficient team, but made acquisition of Marshawn Lynch to slow things down. Despite the love of Derek Carr, he doesn't pass the ball deep down field and Cooper will have to make plays on his own. Expected downgrade to volume in a match-up that reduces big plays makes his already overpriced tag look even worse. 13th most expensive WR on DK, but the 30th most expensive on FD. This is a major discrepancy, and if playing on Fanduel makes him someone that needs serious consideration. He is slightly overpriced on Draftkings though, as he was the #17 WR in DFS in 2016. Plays at home against the Philadelphia Eagles, a team that has a surprisingly good secondary (FOO ranking of 3rd overall). Was the #17 WR in DFS on draftkings last year playing on the Browns with a clown car of bad QBs after a transition from QB to WR. Now plays on the best offense per play in the league with a fringe top tier QB as a WR1, and should have the volume to pay of tag. Overpriced on DK, but severely underpriced on FD, and warrants exposure just based on that alone. TE is generally a pretty easy position to break down, at least from a pricing perspective. The Top tier guys are all very easy to decipher, typically priced in the $5000 price and above range, and then we have guys that run plenty of routes priced between around $3500 and $5000, and below that are the TD dependent dudes that won't make value unless they get one of their 3 targets in the end zone and convert it. There are very few situations where paying all the way up for a TE (such as Greg Olsen this week) will be the straight forward best play, as a TEs upside is generally much less than that of a WR and what we really want from this position is a 2 TD performance on 4 or 5 catches. Pricing for week 1 is actually kind of difficult, I must admit. Greg Olsen has a fantastic match-up, but is priced all the way up at $6200, meaning that you either have to go mid-tier WR or RB in order to fit him. It's easy to just punt TE and move on, but there are a lot of question marks with injuries and position movements happening with a lot of the TEs below $3000, so that might be a path that leads to more downside than the perceived upside. It'll be interesting to see who people like and where the chalk goes. Priced as the 7th most expensive TE on DK, 6th most expensive on FD, but has not had a fantasy point in over a year. Plays at home against the Jaguars, a team with a killer defense on paper but a lot of young talent that can make mistakes. Who will be his QB? Will he be running routes or staying in to block like usual? Can we count on his upside when we haven't seen it? This is a trap of a situation, with no historical values and uncertainty at QB. 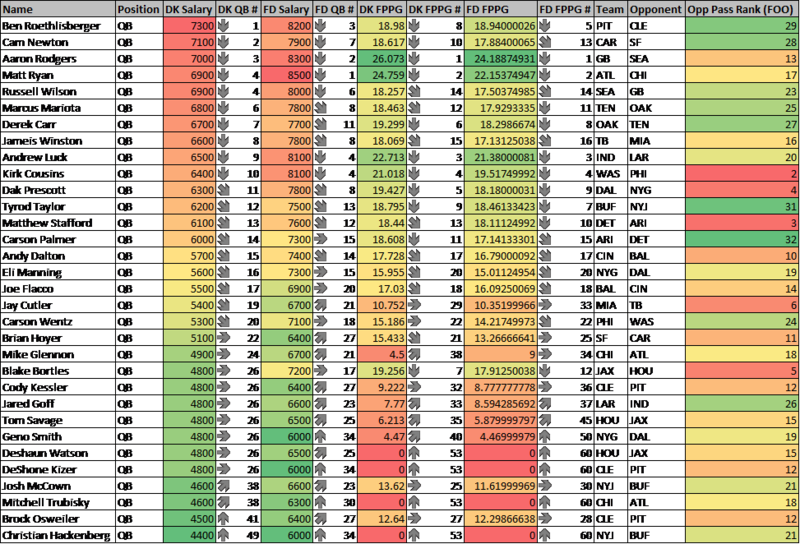 11th most expensive TE on DK, 7th most expensive on FD, but was the #1 and #5 TE in DFS per site, respectively. Large difference in price and expected value. Plays on the road against the Washington Redskins, a team that ranks 25th overall out of 32 teams in defending the TE position. Should be a fast paced game with lots of pass attempts since neither team has a solid running attack. With the departure of Jordan Mathews to the Buffalo Bills, Zach Ertz should see an increase in targets over the middle, while Alshon Jeffery gets the outside work. The Redskins have good CBs, but their linebackers are slow in coverage and allow good separation. Ertz will pick up all the work over the middle from Mathews and finished #1 TE on DK last year per game, will continue to dominate in good matchup. 13th most expensive TE on DK, bur 25th most expensive on FD. Large gap in price between the sites, and underpriced over on fanduel where he finished #16 in FPPG in 2016. Plays at home against the New York Jets, a team that will be giving up points all year and may not win a single game. Finished 2016 19th overall against TE, will be worse. Departure of Sammy Watkins makes Charles Clay the best target for short yardage and possession situations. Saw a large uptick in targets in Watkins absence, that trend should continue and give him the volume necessary for a TE15 finish or better again. Great matchup and secure volume makes him a great play on fanduel, slightly overpriced on DK. CHECK OUT PART 2 OF THE SERIES HERE. Thanks for reading, LET'S GET READY FOR SOME FOOTBALL. As always you can find me on Twitter at Paydirt_DFS for all your DFS needs!